A traditional bay fronted detached family house situated in a popular residential area with easy access to both local communities and both road and rail communications. The property has recently undergone a complete overhaul and refurbishment. This includes the provision of an extremely high quality bespoke open living kitchen with spectacular glazed sliding entrance doors and patio access. The property is constructed of brick or block work with external painted render with natural stone heads and quoins. Composite panel effect entrance door with sealed unit double glazed window, herringbone set parquet floor, sealed unit uPVC double glazed side window, full wall mounted feature radiator, traditional plastered coving, fitted cover with mirrored front. With oak panel door. Herringbone parquet floor. Corner bracket wash hand basin, low level WC. Half ceramic tiled walls, wall mounted feature radiator, uPVC double glazed window, plastered coving, three LED ceiling lights. Dressed sand stone ‘Adam’ style fireplace with cast iron multi-fuel stove with raised slate hearth and back. Original stone mullion bay window with hard wood double glazed replacement sash windows. Double panel central heating radiator, plastered coving and centre rose. Oak glazed doorway leading back to reception/hallway. Solid limestone ‘Adam’ style feature fireplace with cast iron multi fuel stove on raised slate hearth and back. Sealed unit double glazed hard wood sash window to front elevation, twin sealed unit uPVC double glazed windows to either side of chimney breast, plaster coved ceiling, ceiling rose and double panel central heating radiator. Feature Full Length Glazed Sliding Door by ‘Eclisse’ leading from the sitting room to the dining kitchen. Recently fully refitted superb modern ‘Pronorm’ dining kitchen. Range of high quality kitchen fitments including peninsula preparation area with built in ‘Neff’ induction ceramic hob, range of cupboards to both sides, ‘Corian’ work surfaces, ‘Neff’ illuminated stainless steel extractor system to ceiling with built in lighting. Full wall built in high gloss lacquered units with large ‘AEG’ fridge and separate freezer. Built in ‘Neff’ appliances including, steam oven, microwave oven, steamed assisted electric oven and separate electric oven. Built in ‘Neff’ dishwasher. Range of base units with ‘Corian’ work surfaces and drainer, ‘Belfast’ style sink in ‘Corian’ with side sink with ‘Franke’ chromed mixer tap and boiling water supply. Matching large ceramic tiled flooring, ‘Myson’ central heating fan assisted skirting heater, electric under floor heating. To the east elevation from the dining area is a three section ‘Schuco’ bi-fold double glazed patio doorway having an electrically remote controlled internal blind system which will require no maintenance or cleaning as it is fully hermetically sealed. This leads onto a stone patio area overlooking the gardens. The property has the benefit of a centralised vacuum system with a ‘Vacpan’ situated in the skirting to the kitchen with separate outlets in the hallway, lounge and first floor landing. ‘Franke’ stainless steel sink with chromed mixer tap, built in base units and ‘Corian’ work surfaces, wall mounted units, separate cupboard with wall mounted ‘Worcester’ gas boiler providing central heating and domestic hot water. Ceramic tile floor matching kitchen, ceiling lighting, uPVC double glazed rear doorway. Oak hand rail and traditional oak staircase and spindle. Full wall range of mirrored ‘Sliderobes’ wardrobes with sliding fitments. Retractable TV mounting system. Separate wardrobe with pressurised hot water cylinder. Roof access point with concertina aluminium ladder gaining access to good storage area. uPVC double glazed window to gable elevation, single panel central heating radiator, coved ceiling. Containing four piece suite comprising ‘Victoria and Albert’ stone resin bath with chromed waterfall mixer tap and matching hand shower fitment. Wet room style full body shower fitment with extractor and lighting, de-mister mirror over wall mounted wash hand basin and WC, ceramic tiled walls and floor, uPVC double glazed window, wall mounted brush steel radiator towel rail. Full wall range of ‘Sliderobes’ wardrobes with mirrored fronts. Sealed unit double glazed timber sash window to front elevation with fitted blind, sealed unit uPVC double glazed window to rear elevation, single and double panel central heating radiators. Sealed unit double glazed hard wood sash window to front elevation, double panel central heating radiator, coved ceiling. Sealed unit uPVC double glazed window to gable elevation, single panel central heating radiator. Containing three piece suite comprising panel bath with chromed shower fitment, pedestal wash hand basin, low level WC, half ceramic tile walls, wall mounted radiator towel rail, sealed unit double glazed hard wood sash window to front elevation, extractor fan. Very nicely proportioned traditional garden areas mainly laid to lawns with surrounding hedgerows, raised stone flagged pathway and patio area, raised patio area with chrome glazed balustrade. Between the main house and the garage is a ‘Canofix’ glazed courtesy canopy. 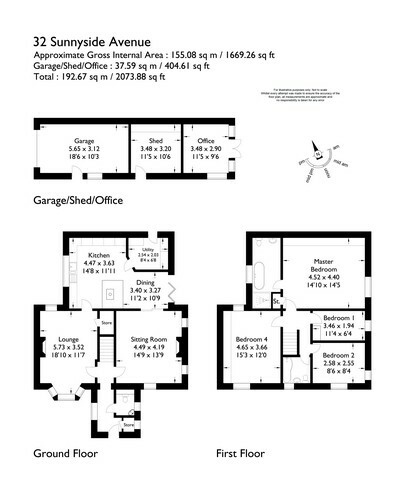 Detached single garage of similar construction to the main house, up and over door, light power and water installed, side timber entrance door. To the rear of the garage is a separate work shop and store. To the east elevation is a large tarmacadam parking area for several vehicles. To the rear of the garage is a bespoke timber office system this is excluded from the sale and the vendors are going to re-site. Please Note:MSW Hewetsons, their clients and any joint agents give notice that; They are not authorised to make or give any representations or warranties in relation to the property either here or elsewhere, either on their own behalf or on behalf of their client or otherwise. They assume no responsibility for any statement that may be made in these particulars. These particulars do not form part of any offer or contract and must not be relied upon as statements or representations of fact.